There are simply too many choices around for food in Manila. 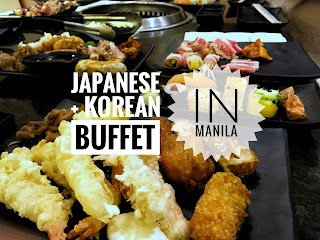 If we want to celebrate an occasion or a holiday, we like to go to one place where there are many dishes to choose from, Manila buffets like Sambo Kojin are a good place to go to. Here you get different cuisine choices, Japanese Yakiniku, Korean Barbecue, and more. They were all colorful and inviting. Save space for dessert because they have so many choices! If ever you go to Sambo Kojin, go earlier than 12nn (for lunch) or 6pm (for dinner) to avoid being placed on the waiting list.